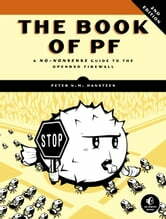 This second edition of The Book of PF has been completely updated and revised. Based on Peter N.M. Hansteen's popular PF website and conference tutorials, this no-nonsense guide covers NAT and redirection, wireless networking, spam fighting, failover provisioning, logging, and more. Throughout the book, Hansteen emphasizes the importance of staying in control with a written network specification, keeping rule sets readable using macros, and performing rigid testing when loading new rules. The Book of PF is for BSD enthusiasts and network administrators at any skill level. With more and more services placing high demands on bandwidth and an increasingly hostile Internet environment, you can't afford to be without PF expertise.